How are online shops taking care of their customers? Genesys survey reveals Romanian internet shops are not using the tools to increase their sales. Romanian online stores are unnecessarily preparing for profits: they do not try to contact proactively creditworthy customers who put the goods into the basket and therefore the purchase is not completed. Additionally, prospective customers know nothing because the stores do not investigate customer behavior during the purchase process. Genesys conducted an experiment in the Romanian Market with major top online retailers in Romania by registering on their websites, giving an email and phone number, shopping for approximatelly 850 LEI worth of merchandise, and then abandoning the shopping carts.. 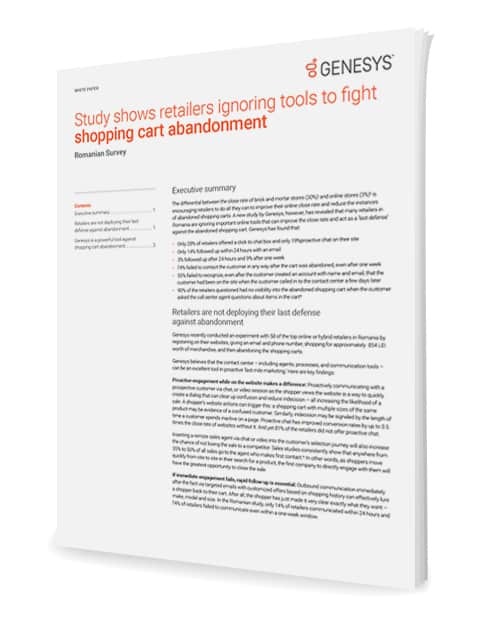 If you are interested in detailed results and wish to learn how to get customers to complete online purchases or how to sell them more, download the study.